The NBA's most hopeless franchise hit a new low after firing its head coach just five days into the season. This level of dysfunction can only be remedied in one way: With a new owner. The Suns’ latest long-term plan—as thin, comically optimistic, and completely lacking in self-awareness as it was—lasted less than five days. It’s rich that a three-year, take-it-slow developmental plan self-combusted after three games, but Sarver’s need for a scapegoat was real. The Suns did not put out a professional effort against the Blazers in their home opener, a fact that can only be partially excused away by GM Ryan McDonough’s G-League level roster. At media day, Lakers GM Rob Pelinka evoked the Broadway play “Hamilton” to paint his rebuilding team’s identity as “young, scrappy and hungry.” McDonough’s Suns under Watson? Young, napping and grumpy. Replacing Watson with veteran assistant Jay Triano on an interim basis solves nothing, though, neither did replacing the beleaguered Jeff Hornacek with Watson in 2016. Phoenix’s underperforming players are a symptom, not the disease. The Suns suffer from a broken culture created by Sarver and repeatedly reinforced during McDonough’s error-filled run. Bledsoe epitomizes Phoenix’s deep, irresistible rot. The Suns played hard ball with him during rookie extension negotiations that dragged on and on for no good reason. Then, they teamed him with ball-dominant guards, Isaiah Thomas and Goran Dragic, in a misaligned three-headed monster. Then, they abruptly reversed course, strip-mining the roster and undertaking a youth movement. Then, they shut him down in mid-March last season to pursue a tank job that failed to land Lonzo Ball or Markelle Fultz. Why on Earth would Bledsoe want to be in Phoenix? The Suns nickel-and-dimed him, they made misstep after misstep around him, and they took away his right to play for an entire month in 2016-17. When Bledsoe arrived in Phoenix, he was a promising 23-year-old trying to prove that he could run his own show. Now, he’s nearly 28, with no playoff appearances as a Sun, with his third coach in three seasons, and with no help on the horizon. Honestly, it’s a miracle that Bledsoe took this long to press “send” on his Tweet. Since leaving Phoenix, Thomas blossomed into an MVP candidate in Boston and is set to play for a title in Cleveland. Dragic enjoyed a career year in Miami and should make the playoffs for the second time in three seasons. Markieff Morris, Marcus Morris, and others have all fled the desert for greener pastures and never looked back. Does anyone doubt that Bledsoe will enjoy a more stable environment and greater earning potential wherever he lands next? Given this track record, shouldn’t Booker, who is still just 20, start working on his own exit strategy too? Sarver made this bed and now he’s stuck laying in it. 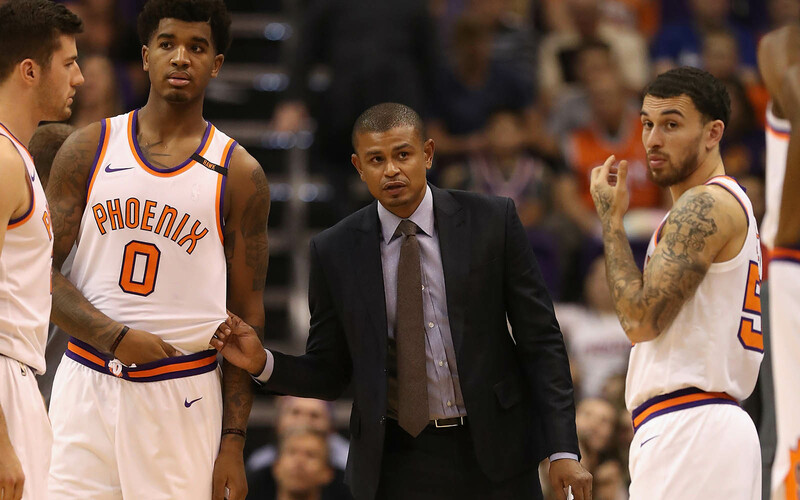 After the Suns locker room imploded on Hornacek, Sarver opted to hire Watson, a rookie coach, at a rock-bottom price. While Watson, a thoughtful and well-respected former player, wasn’t exactly a Coach of the Year candidate, he inherited a toxic locker room and was expected to lean heavily on raw players like Marquese Chriss and Dragan Bender. The owner got precisely what he paid for. The same holds true for McDonough. The first-time GM’s inexperience has shown through over and over, whether in his handling of Bledsoe, the Dragic trade and its aftermath, the Thomas trade and its aftermath, the disastrous trade for Brandon Knight, the drafting of Alex Len, the Morris brothers saga, the sloppy handling of Hornacek’s prolonged departure, the ill-advised Tyson Chandler signing, the unsuccessful pursuit of LaMarcus Aldridge, the shameless tanking, and all the rest. He’s had years to build a culture and find players who fit that culture, and yet all he’s done is make an impressively wide array of mistakes. It was Sarver who decided to let a rookie executive learn on the job. So it is Sarver who ultimately shoulders the blame for the damage to his franchise’s assembled talent and reputation. Remarkably, after that long list of backfiring trades, empty lottery picks and talent misevaluations, Sarver granted McDonough a contract extension in July. Perfect. With any luck, Phoenix’s terrible opening week will serve as a wake-up call to Sarver. His stated plan is a pipe dream. The Suns can’t reasonably expect to have two All-Stars by 2020; they’ll be lucky if Booker alone evolves to that level given the dysfunction around him. And they certainly can’t expect to land two max-worthy free agents by 2020. Not when the Suns have only a history of losing and disgruntled players to sell to prospective stars. Not when McDonough’s biggest signing to date was a well-past-his-prime Chandler. And not when the league’s best players are increasingly teaming up with each other in winning environments. Sarver’s plan will only work if Phoenix develops its current talent, attracts new talent, and constructs an environment in which that collected talent stays happy together. Does Sarver really believe his organization can somehow magically check all three boxes after repeatedly falling short on all counts? Or, does he know deep down that his vision sounds far-fetched to anyone that’s paid attention to his organization since Steve Nash’s departure? Here’s the good news: There’s a better plan available to Sarver, one that will leave him with stuffed pockets and his ego intact. This plan doesn’t require any public acknowledgment of mistakes. It doesn’t require years of waiting on teenagers to pan out. It doesn’t require trading Bledsoe for pennies on the dollar. It doesn’t require yet another coaching search. It doesn’t require waiting a year to see whether McDonough gets his act together. It doesn’t require turning over the front office again. It doesn’t require fending off the vultures who are undoubtedly sizing up Booker already. It doesn’t even require competent decision-making or strategic thinking. All this plan requires from Sarver is a desire for money. Immediate relief from his countless, recurring headaches will be an added bonus. Sell the Suns. Cash out. Sarver led a group that purchased the Suns for $401 million in 2004 and, thanks to the league’s ongoing boom, the franchise’s value was pegged at $1.1 billion by Forbes back in February. As a point of reference, the Rockets were recently sold for a record $2.2 billion after being valued at $1.65 billion in the same Forbes survey. If Sarver decides to trade his fairly-tale vision for real dividends, a huge windfall awaits. Over the summer, Sarver claimed that he was “a better owner today” than he was at the height of the Nash era, because he had “learned more about the business” and come to understand the importance of a transcendent star. Of course, no one besides Sarver can see the alleged progress, not when the Suns are poised to win fewer than 25 games for the third straight year, not when Bledsoe is unleashing social media distress signals, and not when Watson is being unceremoniously dumped. Booker might be a nice scorer, but he’s got a long, long way to go before he has a Nash-like impact. Even Sarver can see that, right? There are 79 games left in Phoenix’s season, a cruel fact that will generate unavoidable and gloomy questions in the coming days. Which coach would be desperate enough to sign on as Watson’s full-time successor? Which star would choose to play in Phoenix after seeing what happened to Bledsoe? Which executive would be willing to undertake years of arduous work to improve an abysmal roster if McDonough winds up being the next to go? Sarver should do himself, his city, his players and his fan base a favor by focusing his attention on a variant of those queries. Namely: Which eager, basketball-loving billionaire is ready to pony up for the Suns? Given the NBA’s robust economic landscape, a willing buyer might even emerge in as little as five days.